Olmsted works at a pace that would be challenging for a much younger man. His body gives him constant pain as he travels. The date of the Chicago Fair’s dedication is now October 21, 1892; it has been shifted back to allow New York its own dedication ceremony on October 12. Olmsted is irritated that Burnham still wants to use modern steamboats at the Fair. Olmsted also wants the “Wooded Island” area of the Fair to be free of all buildings, but powerful men, including Theodore Roosevelt, want structures to be built there, and Olmsted is forced to give in and allow building in the area. At the same time, he hears of plans to build a road through Central Park, which he helped design. Upset with this news, he decides to travel to Paris with his family — Larson notes that the journey will be dark for him. Olmsted is more interested in elegance than ostentatiousness — thus, he wants the island to be entirely natural, rather than covered in architecture. While his preferences are clearly a function of his profession as a landscape artist, Olmsted has to give into the preferences of others who are more powerful, such as Roosevelt. It’s important to keep in mind that Olmsted is no less concerned with his legacy than Burnham or his colleagues; it’s just that he wants to create a legacy in a slightly different way. His legacy is built not on bigness but the fulfillment of his own vision. Sol Bloom hears that the Algerian village he wanted for the World’s Fair has set sail for America, a year too early. Bloom continues to exploit the rest of the world for the entertainment of tourists traveling to the WF. Yet his plans aren’t always perfectly executed. In Paris, Olmsted sees the long lines and dirty areas surrounding the Eiffel Tower, but also notes that the fair area is simpler and more streamlined than Chicago, reinforcing his view that the World’s Fair in Chicago should be kept free of opulent buildings. He sees gardens in England, inspiring him to keep the Wooded Island free of architecture. He also hears news of cholera outbreaks in Russia, making him worried for Chicago. Olmsted is both practical and lofty-minded. He knows that cholera and disease could ruin the Fair, but he also wants the Fair to be as visually striking as possible, without being too over-the-top. Olmsted’s aesthetic tastes are noticeably different from those of Burnham, who favors heavy, neoclassical structures. Bloom welcomes the Algerians to New York, but fears that they are so disorganized that they will be arrested. One of the Algerians, who introduces himself as Archie, claims to have been a manservant in an English home; Bloom hires him as his personal bodyguard and assistant. Meanwhile, Burnham continues to turn town plans for buildings to rival the Eiffel Tower, including one from a credible-seeming man whose idea Burnham dismisses as too “fragile.” Meanwhile, windstorms destroy some of the Fair’s buildings in progress. To solve these problems, Burnham summons the Eastern architects, who propose a novel solution to the coloring and decoration of the buildings. McKim introduces Burnham to Francis Millet, a New York painter, who proposes painting the buildings at the World’s Fair with white lead paint. Bloom continues to exercise loose control over his exhibit. Burnham tasked with far greater responsibilities, is less willing to take risks, and turns down the engineer’s plans. He’s being particularly cautious because of the weather, which destroys much of the progress Burnham has made in completing the WF. The decision to paint the buildings white, giving the Fair the nickname “the white city,” puts Burnham in contact with Millet, the same man he tries to contact years later while Millet is on the Titanic. Floods cause Chicago’s drinking water to become filthy; Burnham invests more time in providing clean water to fair-goers. He builds a pipeline connecting Chicago to the Waukesha, where the spring water is cleaner, but is forced to build around the village of Waukesha itself, since the villagers strongly oppose any building there. Burnham is forced to be flexible; he wants to get water from the village, but settles for water from the county. He can’t become too invested in any one plan, because plans changes constantly due to factors outside of his control. The pace of building for the World’s Fair increases, but in June, a large part of the Manufactures and Liberal Arts Building collapses. The contractor blames Burnham for encouraging him to proceed too quickly. Workers die throughout the summer. Meanwhile, Burnham has a major victory when Congress awards him exclusive control of the World’s Fair, recognizing that Burnham’s arguments with Davis are counterproductive. Burnham assumes responsibility for almost every disaster at the WF, whether he deserves responsibility or not. At the same time, he enjoys great authority and creative control over the event — blame is the price he pays for this great authority. In Pittsburgh, an unnamed engineer tests his design, then submits it to the Ways and Means Commission of the World’s Fair, confident that it will rival the Eiffel Tower. At first the Commission approves his plan, but then denies it, afraid that it is too unstable. The engineer spends a huge sum of money on further planning, and attracts a large number of investors. He prepares to approach Sol Bloom who seems open to unusual ideas. Larson continues to deny readers the name of the engineer who seems increasingly important in his book. In the face of the huge bureaucracy of the Commission, the most successful people at the WF are those like Bloom and the engineer who refuse to take “no” for an answer and can think of creative solutions to their problems. With Dedication Day only a month away, Olmsted returns from Europe, feeling ill and tired. In Chicago, he is pleased to see that the buildings are nearing completion, and that his men have planted the appropriate flowers and trees, thought they won’t be visible for some time. Burnham has approved a beautiful style of boat for the World’s Fair, exactly the kind Olmsted wanted. Olmsted is put in an uncomfortable position: he has to wait for the plants and trees he’s organized to blossom and grow. Even by the standards of the WF, this is a slow process. Despite the lack of visible results to Olmsted’s name at the Fair, Burnham respects him enough to listen to his opinions on boats. On Dedication Day, the Chicago newspapers, out of respect for their city’s efforts, specifically ignore the desolate look of the park — Olmsted’s trees and flowers need time to grow. Francis Bellamy composes the Pledge of Allegiance for the occasion of the Dedication. The Chicago officials designing the Fair sometimes fight amongst themselves, but at other times, the people in power in Chicago can unite to support their city, as when they suppress information about the barrenness of the park. This is because the WF inspires great feelings of patriotism and civic pride, as Bellamy’s Pledge demonstrates. Tens of thousands of Chicagoans attend the Dedication Ceremony in the Manufactures and Liberal Arts Building, even though it looks unfinished. The space is so enormous that it’s difficult to hear anything. Harriet Monroe, John Root’s sister in law, composes a long poem for the Ceremony, but no one can hear it, and when she tries to sell copies, only a few are sold. The emphasis on ceremony and opulence at the WF is sometimes self-defeating, and those who take the occasion very seriously, like Monroe, are portrayed as somewhat comical. The Ceremony is held in such a large space, for instance, that almost no one can hear it. Olmsted may be right to criticize the enormity of the buildings — they don’t create a mood of fun and joy, just confusion. Arn, Jackson. "The Devil in the White City Part 2, Chapter 7: Dedication Day." LitCharts. LitCharts LLC, 1 Jul 2015. Web. 23 Apr 2019. Arn, Jackson. 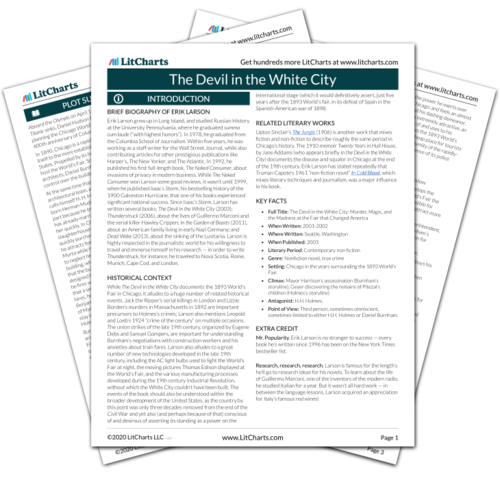 "The Devil in the White City Part 2, Chapter 7: Dedication Day." LitCharts LLC, July 1, 2015. 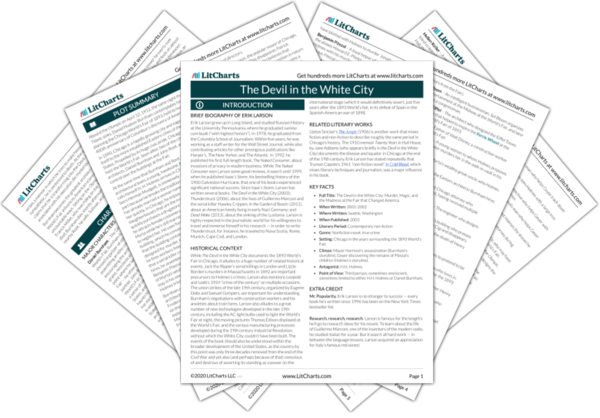 Retrieved April 23, 2019. https://www.litcharts.com/lit/the-devil-in-the-white-city/part-2-chapter-7-dedication-day.